Harvard and Wharton are the best business schools for full-time MBA students in the US – according to the 2018 Best Graduate Schools rankings released by the US News & World Report today. Chicago Booth follows in third place, with Stanford, MIT Sloan and Northwestern University’s Kellogg School of Management tied in fourth. The reputation of North America’s top-ranked business schools means most can now charge over $120,000 in full-time MBA tuition fees, making hundreds of millions of dollars from their students each year. 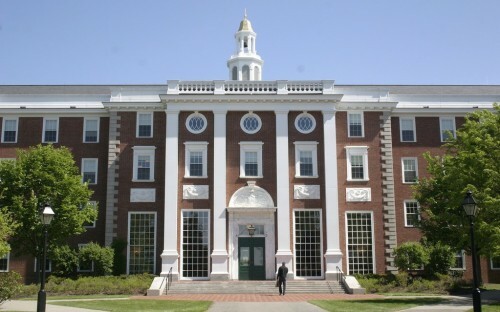 Harvard’s two-year, full-time MBA costs $63,675 in tuition per year. 1,871 people are enrolled in the current MBA class. Wharton’s costs $67,516 per year. 1,708 are enrolled in the program. You do the math! Despite the high fees, MBA admissions is hugely competitive. In 2015, 9,759 people applied to Harvard’s full-time MBA. Just 1,073 were successful. That’s an 11% acceptance rate. Chicago Booth’s full-time MBA drew 4,160 applications in 2015. Only 973 were successful. Booth’s acceptance rate is a tricky 23%. Booth boasts a class average GMAT score of 726. Harvard, 730. The cheapest tuition fees among the top-ranked schools can be found at the Haas School of Business at the University of California, Berkeley, which charges in-state full-time MBA students $56,009 per year, and out-of-state students $67,560. At the University of Texas at Austin’s McCombs School of Business, full-time, in-state MBA students pay $34,296 per year, out-of-state students pay $50,296 per year. And at UNC Kenan-Flagler, in-state MBA students pay $40,015 per year, while out-of-state students pay $56,138. US News & World Report’s annual rankings are based on a variety of factors including graduate employment rates, starting salaries, and class average GMAT score. MBA programs were also ranked by specialization. Wharton was named best business school for finance. Babson College’s Olin Graduate School of Business for entrepreneurship. Kellogg for marketing, and McCombs for accounting. Berkeley: Haas topped the part-time MBA rankings – with 802 enrolled students and an acceptance rate of 47.4% - followed by Chicago Booth in second, and NYU Stern and UCLA Anderson joint in third. Temple University's Fox School of Business and The Ohio State University's Fisher College of Business also feature in the top 10. US News & World Report’s top three business schools for Executive MBA programs were Wharton, Chicago Booth, and Kellogg.